Posted by Yilan in Albania, Turkey, Yunanistan. Greece over the past few years has become a source country concerning the entrance of a large number of illegal immigrants, mostly from Asian and African states, who enter mainly through the Greek-Turkish borders. The problem erupted on a full scale in the early 00s and continues with increasing pace. In 1999, it was reported that 17,000 illegal immigrants were arrested in the region of Evros alone, and the daily output of this illegal industry was calculated at 100,000 euros. Today, it has been estimated by the Greek police that up to 1,000 illegal aliens try to trespass the country each week, and that concerns just the Eastern Aegean island region. The vast majority of immigrants arrive from Turkey, which is used as a transit point from Asia to Europe as well as a coordinating center for this activity that is under the control of the organized crime networks in that country. The Turkish authorities have announced from time to time that they expel some 100,000 illegal immigrants from their territory each year, while between 1995 and 2005 they managed to expel over 575,000 and arrest 6,100 smugglers. Posted by Yilan in Albania, Yunanistan. It’s a hopeful glimpse of light that serves as a guide out of the darkness. This is how Jeff Walters, assistant director for campus recreation and leader of Baylor’s outdoor recreation and leadership trip to Athens, Greece, described the immersion of culture between Baylor students and Albanian immigrants. Walters will lead 10 Baylor students as they spend two weeks in July mentoring Albanian youth about leadership and self-esteem. Walters said the plight of Albanian youth, who crossed the border into Athens after the fall of communism in their own country in the 1990s, is desperate. Baylor students may not travel to Greece with a hammer in hand, but they hope to build a lasting foundation of faith. 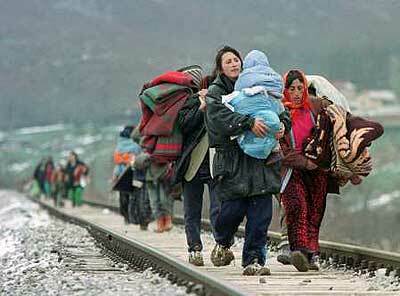 After fleeing from Albania in the 1990s, 500,000 immigrants live in Athens. They are often lacking in education and hope for the new life they, or their parents, were seeking. But two Baylor graduates, Bob and Janice Newell, created a service called Porta, a cultural and spiritual center to help Albanians improve their lives. Upon returning to America, Baylor students plan to maintain the relationships with the Albanian youth through Skype and social media. Baylor students have been preparing to lead these cross-cultural discussions by engaging in team-building exercises and learning about life in Athens. The students will receive course credit in leadership classes through the trip to Greece. He knew he wanted to participate in a mission trip, so when the call for Greece was made he answered. Baylor students will meet with the Newell family to learn more about the operation of the Porta Albanian house, striving to better immigrants’ lives in Athens. Because of the continual needs of the Albanian people living in Athens, Walters said he hopes to establish this mission trip as a tradition for Baylor students. Posted by Yilan in Albania, Macedonia. Two weeks before local elections of 8th May, the municipality of Pustec is filed with signs with names of streets and squares in Macedonian language. Municipalities that once had the name Liqenas has included also the municipal officials of Gazi Baba of Macedonia, while campaigning for the official candidate of the governing coalition led by the DP, Edmond Temelko, who holds the post of president of the Alliance Party of Macedonians for European Integration. In Skopje, the Macedonian media have promoted such a project, adding that it was a donation to the municipality of Gazi Baba, Skopje. The daily Gazeta Shqiptare discovers that road signs are in two languages​​, Albanian and Macedonian, two are in Latin and one in Cyrillic alphabet. Institutions and road signs in the Macedonian language in 9 villages of the commune, named Pustec, in the Prefecture of Korca was settled on April 14th where present was also the Mayor of Gazi Baba, Toni Trajkovski, Teodor Petrov, President of the World Macedonian Congress and Tashko Ivanov, chairman of the Association of Aegean Macedonians. A number of courts in southern Albania have suspended all nationality change requests, local media reported on Wednesday (March 16th), amid suspected violations involved in the process. 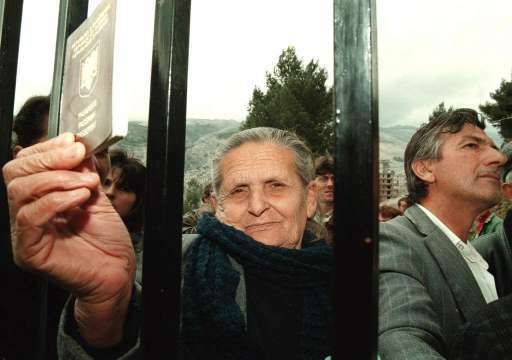 It is believed that in the Gjirokastra and Permet courts alone, about 2,000 citizens have changed their nationality from Albanian to Greek. The courts of Permet and Saranda have asked the Constitutional Court to interpret the law on marital status, on which these requests were based. Albanians topped the list of arrested illegal immigrants in Greece last year, accounting for more than one-third of the total, followed by Afghans and Pakistanis, Greek police said Wednesday. At more than 50,000, Albanians easily outnumbered the rest on the list of some 132,500 illegal immigrants arrested in 2010, according to official figures released by the police. Afghans came in second, accounting for nearly 28,300 people arrested followed by Pakistanis, at 8,830. Most of the arrests took place in border areas, notably on Greece’s frontier with Turkey where more than 47,000 people were intercepted — and where European Union border guards have been deployed since November. 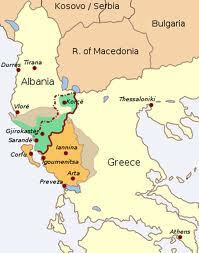 Greece’s border with Albania ranked second in the area where the greatest number of arrests took place in 2010. Not surprisingly, Albanians also topped the expulsions list, with nearly 48,180 deported last year out of some 52,470 in total. Police also arrested 1,150 people accused of smuggling illegal immigrants last year, a drop from the more than 1,700 arrested in 2009. Greece has been overwhelmed by the influx of migrants crossing from Turkey, and is struggling with a backlog of 47,000 asylum applicants, with many awaiting approval for years under conditions that have drawn the ire of rights campaigners.